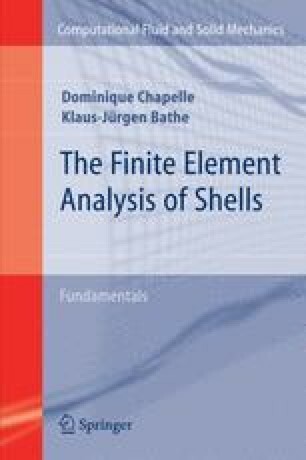 Implicit in the concept of a “shell” is the idea that the thickness is “small” compared to the other two dimensions. In practice, it is not unusual to deal with structures for which the thickness is smaller by several orders of magnitude, in which case the shell is said to be “thin” (consider, for example, the shell body of a motor car). Considering the role of the thickness parameter t in the shell models that we presented in the previous chapter (see for example Eqs. (4.36) and (4.51)), with different powers of t in the bilinear terms on the left-hand side, it is essential to determine how the mathematical properties and physical behaviors of the models are affected when this parameter becomes small.